Luton Town have announced that attacker Josh McQuoid has left the club after his contract was cancelled by mutual consent. The 28-year-old, who signed back in June 2015, had been on the transfer list since the end of last season when manager Nathan Jones made it clear he wasn't in his plans going forward. McQuoid did feature in the Checkatrade Trophy draw against Tottenham U21s this term, scoring the Hatters' equaliser, before a loan move to National League side Torquay United, where he played 15 times scoring twice. 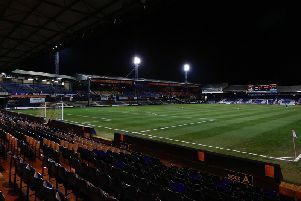 He returned to Kenilworth Road and came off the bench in Luton's Checkatrade Trophy exit to Peterborough United earlier this month, his 45th appearance for the Hatters in two and a half years, netting eight goals in that time.